The Bonnie 5: happy mother's day! I got so many cute cards and art projects from my boys this week. They were adorable, and so sweet. There were a few things in particular, however, that caught my eye. Now my e-friends might not get this, but for those of you who know me, ummmmmmm....I'm Sweedish. After being locked in my house for the past 6 months (read: winter in Nebraska), I do not have a lovely tan. And the short, black hair? I have long blonde hair. Hmmmmm. 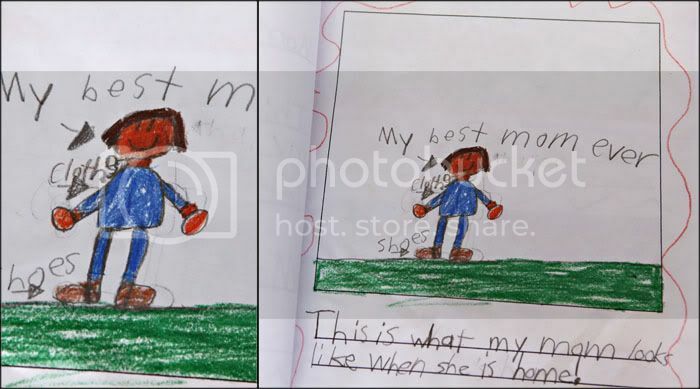 When I questioned my son (oh, and by the way it was my 2nd grader, not my 5 year old), he made some excuse about how "they had to use colored pencils," and he couldn't get the exact color, yada yada. OK, I can get on board with the skin color, but that hair is totally off. This was a lovely card brought home by my preschooler. I questioned why he thought I was prettiest on Sunday, and he said it was because I wore "that black and white thing." Ohhh...my dressy coat. Let me comment on the cheese pizza. I am a health fanatic and you will find nary a chicken nugget nor a bag of frozen french fries in my freezer. The cheese pizza he's referring to is the one we make ourselves with crust from Le Quartier. Just wanted to clarify. 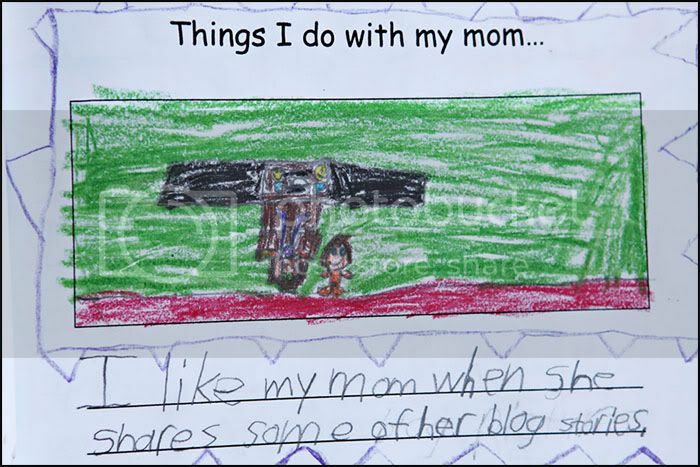 Next: My mom always says, "my blog." Hmmmm. Not sure if this is good or bad. Do I need to cut back some more? And: My mom is funny "in the midnight." ??????????????? He told me later that he meant to say "in the daytime." 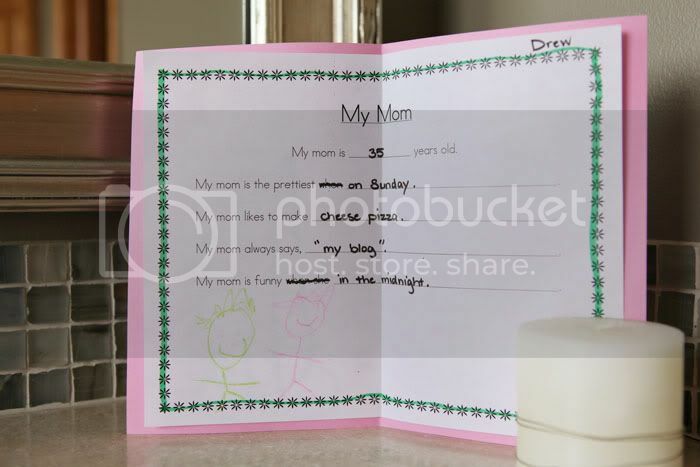 Interestingly enough, my 2nd grader mentioned my blog in his Mother's Day tribute. Shall we move on to Exhibit C? I love this arial view. I'm sitting at my desk, working on the computer. If you look closely (and use a great deal of imagination), Collin drew a picture of the lego men holding the Oreo cookie. See the little yellow lego faces? And in the middle is the black and white Oreo. Love it! OK, the story behind this one is good. Drew comes out of school with this sweet little creation. I saw it, (and channeling an 80's rock concert), held my fingers up in the air, stuck out my tongue and went "Ahhhhhhh!!!!" Are you having trouble with the visual? Drew looks at me as if he'd like to receed into the van seat and said, "Uh, mom. That's sign language for love." That's hilarious!! 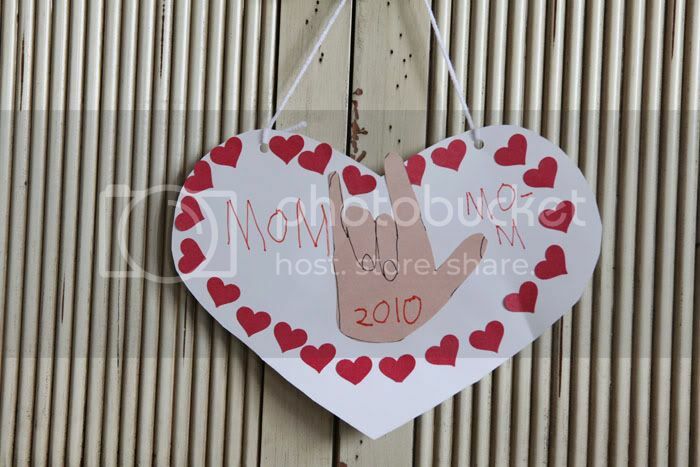 :D Great mother's day memories. Cute! I love kid's art and writing. Always so sweet.